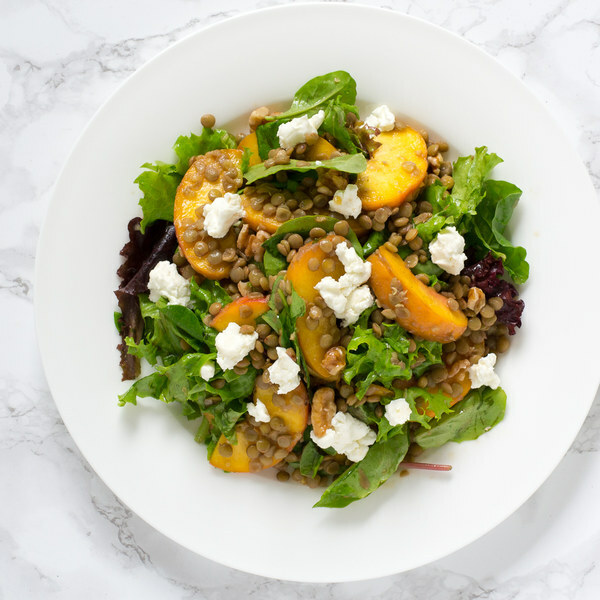 ← Lentil, Peach & Greens Salad with Goat Cheese & Walnuts. Rinse the lentils, then transfer to a small saucepan and cover with hot water (from the tap) by about 2 inches; bring to a boil over high heat. Trim off and discard the root ends of the garlic; peel and mince or press the garlic. Transfer to a small bowl (that will be used to prepare the dressing). Once the water in the saucepan is boiling, reduce the heat to a simmer and cook the lentils until they are just tender, 15 to 20 minutes. Drain in a colander, rinse under cold water, and set aside to cool and drain further. To the garlic, add olive oil, balsamic vinegar, Dijon, salt, and pepper; whisk together and set aside. Transfer the greens to a large salad bowl. Quarter the peaches lengthwise (around the pit) and twist the quarters to separate, then remove and discard the pit; cut each quarter lengthwise into thin wedges. Add to the salad bowl. Roughly chop the walnuts and add to the salad bowl. Crumble the goat cheese with your hands and place in a small bowl. Once drained, add the lentils to the salad bowl; toss to combine. To serve, divide the salad between plates or bowls, top with the goat cheese, and drizzle with the dressing. Enjoy!